Dr. Sarah earned her Doctorate in Veterinary Medicine from the College of Veterinary Medicine at the University of Georgia in 1996. Today, Dr. Sarah is an active member of the Georgia Veterinary Medical Association and the Korean Veterinary Society of America. She finds improving the quality of life of geriatric pets, soothing stress in fearful pets, helping overweight pets get bikini ready and teaching good manners to puppies especially rewarding. 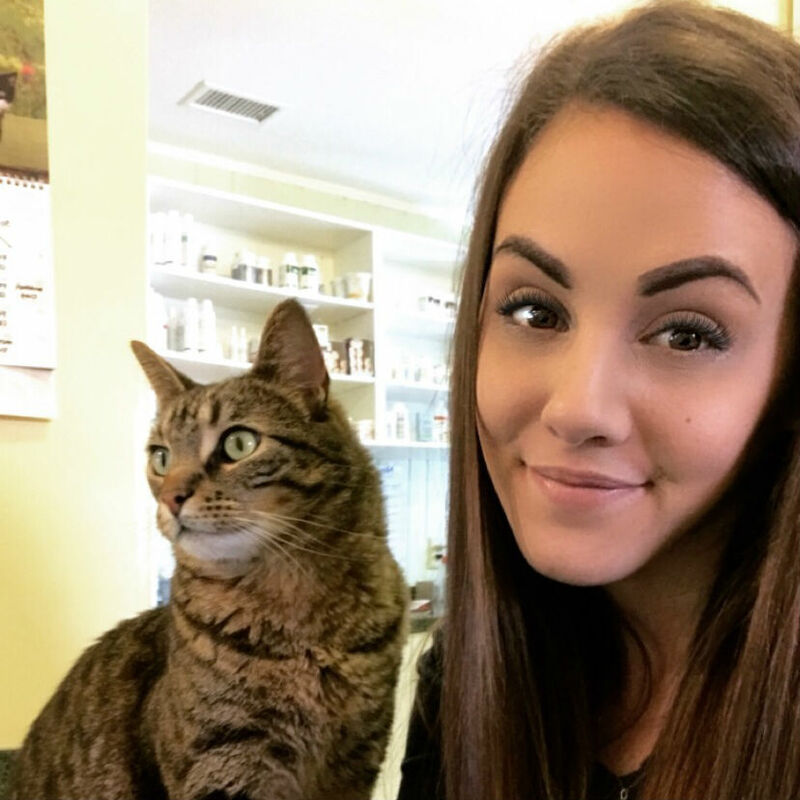 Dr. Sarah is especially interested in feline medicine, internal medicine , dermatology, and pain management. Even though Dr. Sarah grew up with her cats, Shmoo and Penny, and was more partial to the species, she has recently become smitten by an overly friendly and excitable Australian Cattle Dog aptly named Buddy who came into her life by marriage to her husband, Craig. When she is out of the office, Dr. Sarah likes to road trip throughout the southeast with her husband and mountain bikes to explore and ” shred” the trails. Jeff Miller has been a team member since 2006 and currently serves as our veterinary technician. His primary duties include assisting with surgeries and pets in the exam room, preparing and processing laboratory specimens and taking x-rays. Mr. Miller worked in legal and film industries previously and decided to get paid for his passion of pet care instead. He enjoys volunteerism in the assisted living field and spending time with his dog and cat at home. Robert Houshel Jr. has a broad range of knowledge in pet grooming, training and the sheer joy of pet ownership. Robert studied horse grooming years ago with Annalisa Vogt of Vogt Riding Academy. Later years brought him to manage Petco training stores around Georgia and present canine training workshops. It was at Petco that Robert began training as a groomer. Robert has a huge heart and has 2 rescued dogs and 2 rescued cats. Lindsey LaGrange joined the Abbott Animal Hospital team as receptionist in January of 2017. 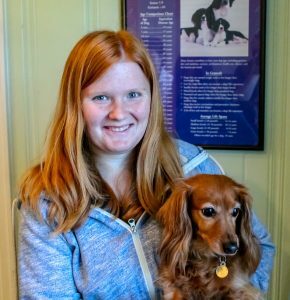 After graduating from Parkview High School, even though Lindsey has always been a pet lover, she did not know that one day she would be working in the veterinary field. Now that she has found her calling, she has been enjoying fostering doctor patient relationships and educating clients about the importance of preventative care. All that she has learned she takes to heart as it applies to her own first dog Cooper, an adorable mysterious mix of hound and lab. Kaitlyn Roney joined the Abbott Animal Hospital team in November of 2011. 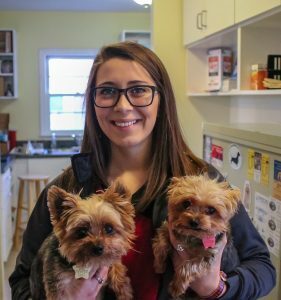 After graduating from Brookwood High School, she decided that working in an animal hospital was her passion. Now that she has found her calling, in 2018 she began her studies at the University of Georgia in pursuit of her Pre-Veterinary Medicine degree. In her spare time she enjoys hiking with her two Siberian Huskies, Aurora and Khalua. She also enjoys cooking and traveling. It is the work of caring persons like Felicia Sherman who carries us through our day to day operations at Abbott Animal Hospital. Not only does she tirelessly and meticulously takes care of our boarding and grooming pets, but she keeps a close eye on them as if they were her own pets at home. Felicia enjoys rehabilitating and placing homeless pets in to new forever homes. Both a lover of cats and dogs, she has a long-haired chihuahua named Baby Girl, a Beagle named Lucky, a pitbull named Romeo and a cat named Cheddar. Felicia graduated from Parkview High School and is currently attending Gwinnett Tech College to later enroll in the veterinary technician program.